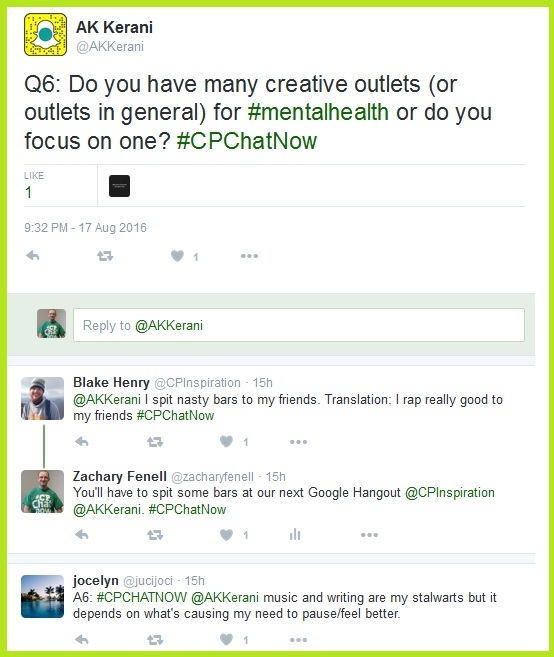 Wednesday, August 24th, 2016 we at #CPChatNow waded into the thought pool’s deep end. 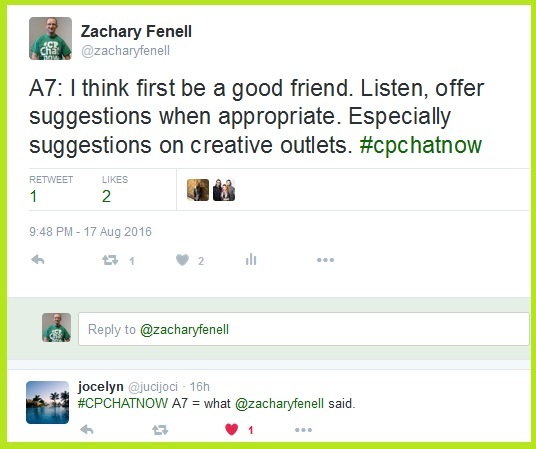 I am co-host Zachary Fenell, ready to recap what turned into a very insightful chat. 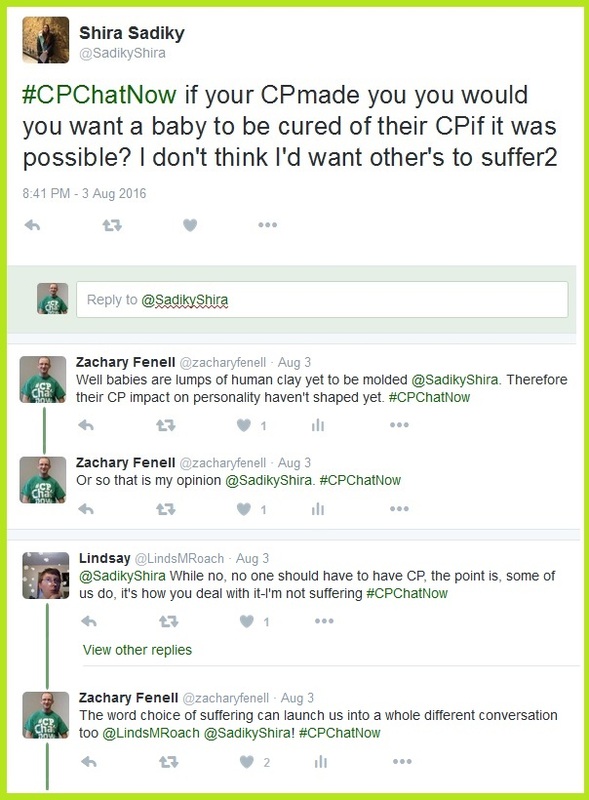 By post end you may think about cerebral palsy in new ways! Oddly enough though, the conversation started off slow. Personally, regular Devin set my night off to a nice start. For your reading pleasure I will add a link here, “You Belong! No Matter Your Cerebral Palsy.” If you enjoy the read, check out my other posts, and even subscribe! 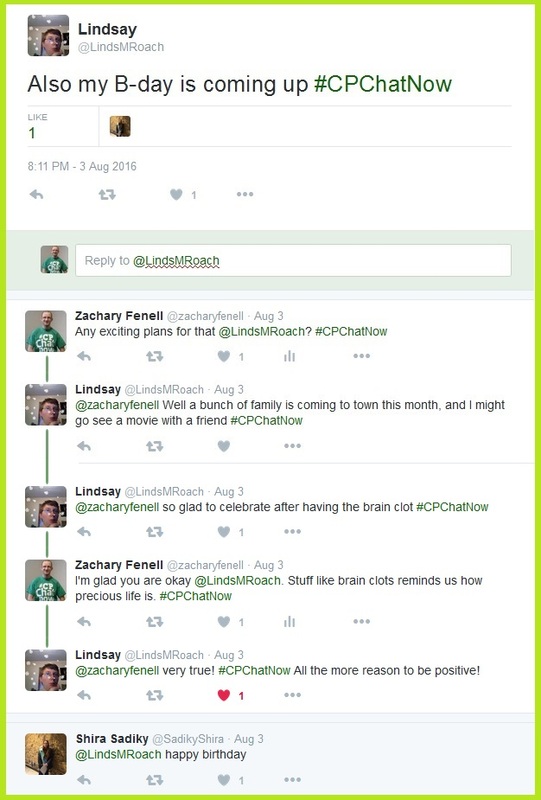 Anyways I should stop self-promoting and refocus on recapping the August 24th chat. Discussion about success began the wading into the metaphorical thought pool’s deep end. Dialogue continued on what makes someone successful and also life’s priorities. 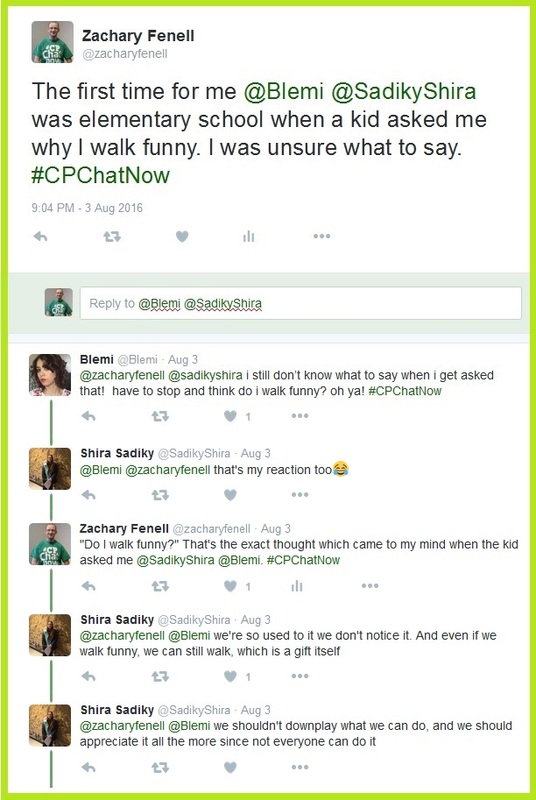 A late comer soon turned the chatter more cerebral palsy specific. 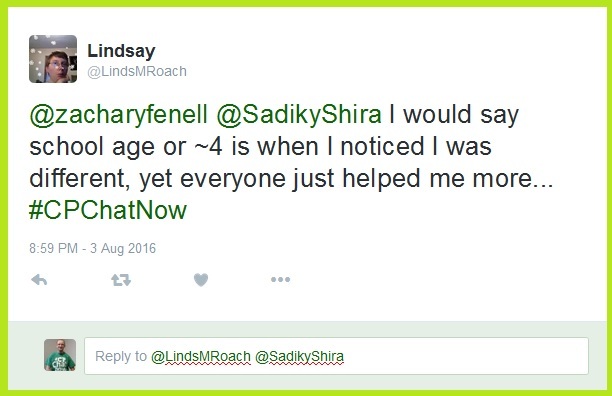 Shira‘s question sparked concern from regular Jen. 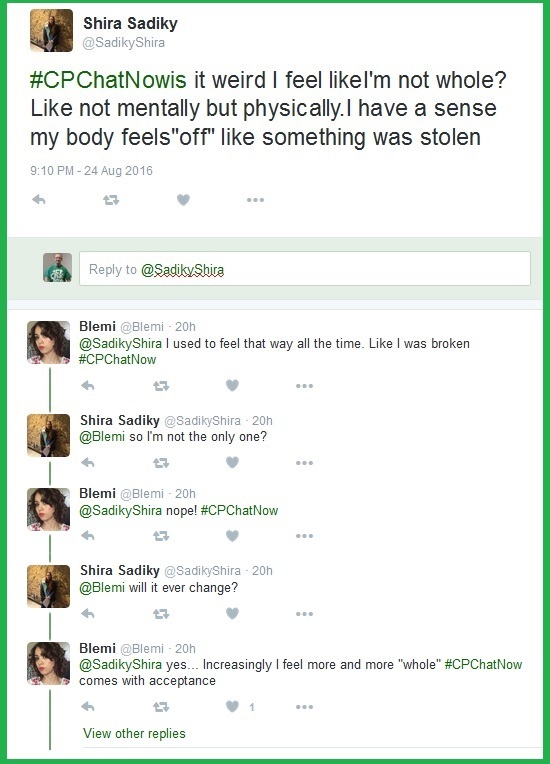 I tried attributing Shira’s feelings in-part to her age. However, additional factors became increasingly evident. Other participants’ responses on the matter fueled my gender theory. Shall we keep exploring the issue at hand? 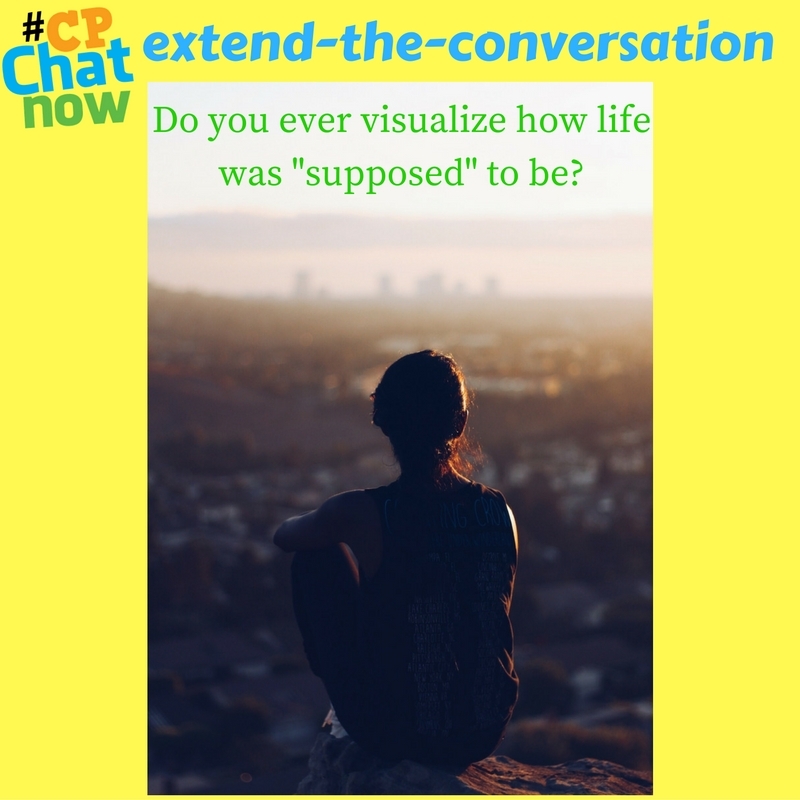 Answer for the week’s extend-the-conversation question “Do you ever visualize how life was ‘supposed’ to be?” Respond via a comment in the “Comments” section. Before wrapping up I wish to revisit a point captured in an above screen shot. 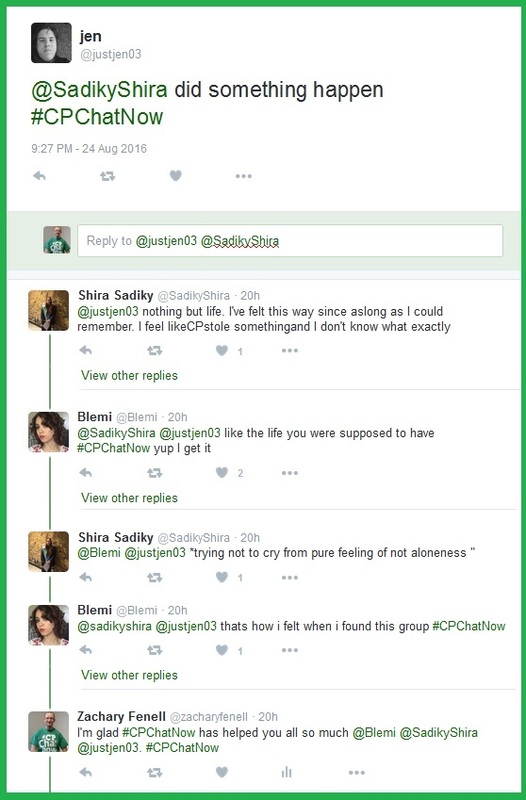 Participants expressed how #CPChatNow reduced feeling lonely. That speaks to a support system’s importance, something emphasized again later in the night. 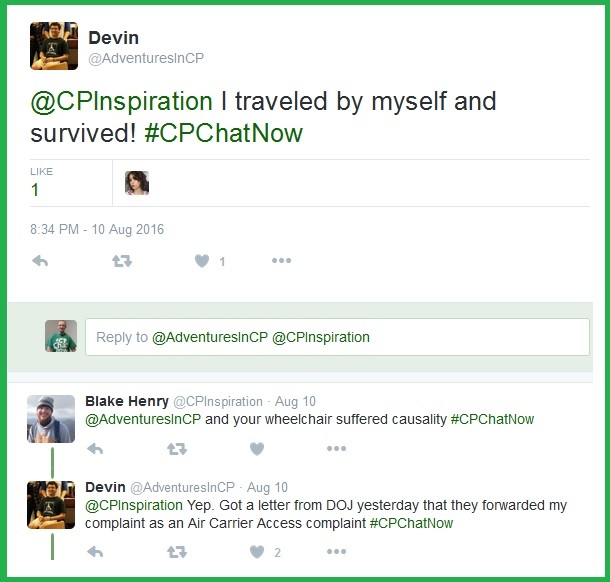 We at #CPChatNow can assist passing the time required to build a good in-person support network. 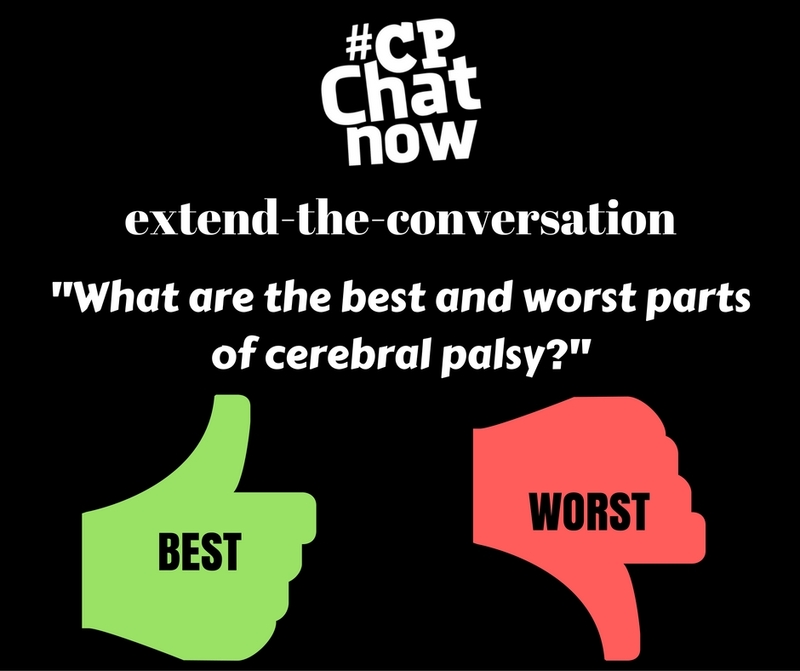 Obviously participating in the weekly cerebral palsy Twitter chat supplies the best way to utilize our support network. Still my co-host Blake Henry and I know not everyone tweets. Hence we work hard to provide other platforms for community contribution. First and foremost like our Facebook fan page. The page shares cerebral palsy related stories daily. Like and leave comments on the posted items. Cerebral palsy, while largely a physical disability, maintains mental health implications. 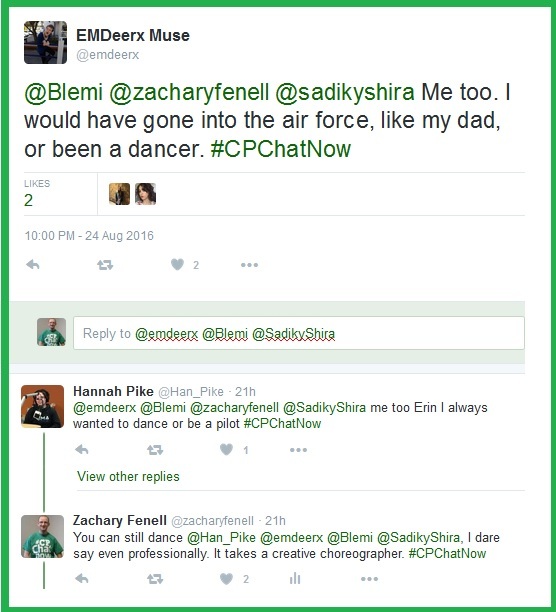 Those remained on full display during #CPChatNow Wednesday, August 17th. 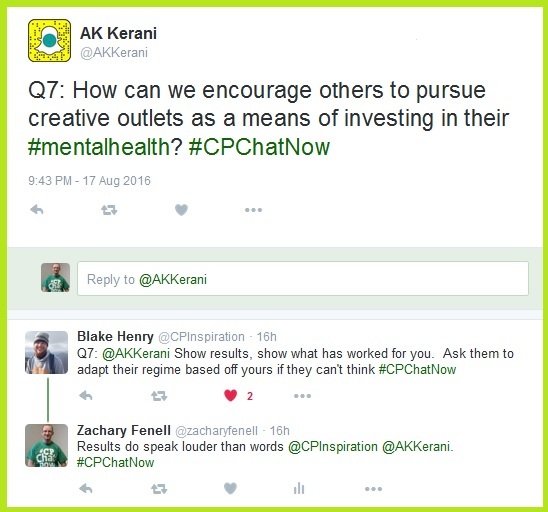 I am co-host Zachary Fenell here to bring you highlights from our “Creative Outlets and How They Help with Mental Health” focus chat. As the clock ticked closer to 8:00pm ET, anticipation built. 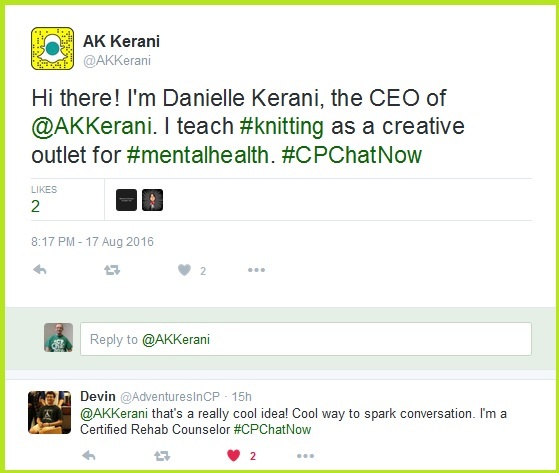 To begin the chat our guest Danielle Kerani (@AKKerani) introduced herself. 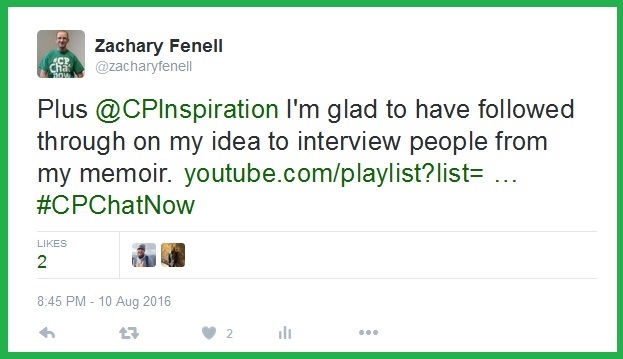 Once Danielle asked the first question, the many creative outlets available became evident. 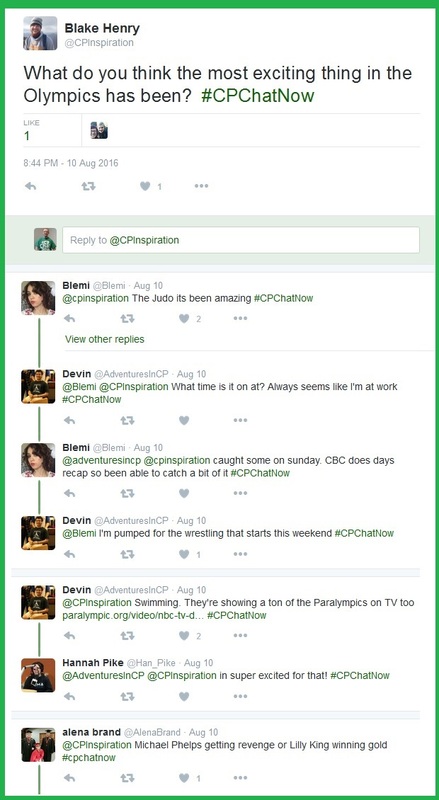 The various creative outlets proves a positive, especially for us in the cerebral palsy community. 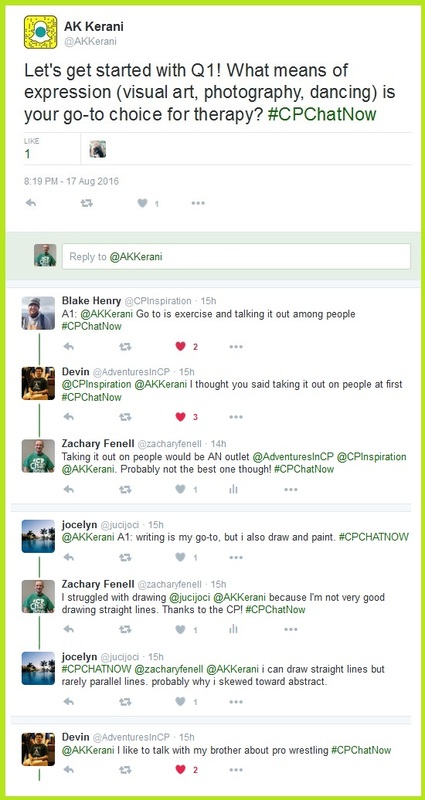 Like my comment about drawing illustrates (pun intended), CP can transform relaxing outlets into cause for stress. Hence the importance to finding the right creative outlet for you! Discovering the correct outlet may lead to multiple benefits too. One community member Yasmin named a great example. 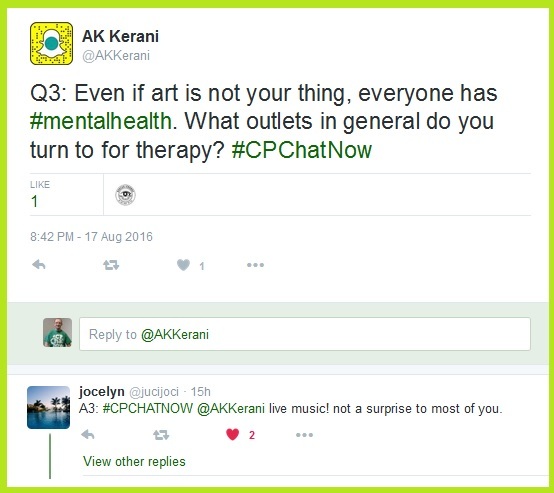 Moving forward question three expanded the dialogue past creative outlets to therapeutic outlets in general. Now what about you? 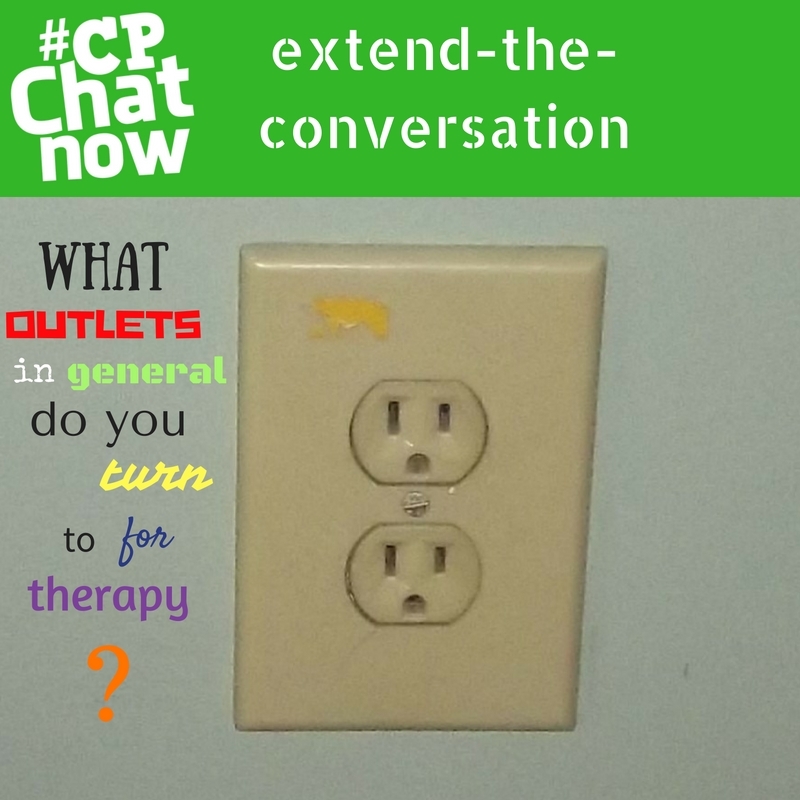 Answer for the week’s extend-the-conversation question, “What outlets in general do you turn to for therapy?” Leave a comment in the “Comments” section to answer. First though, perhaps we should continue with the recap. 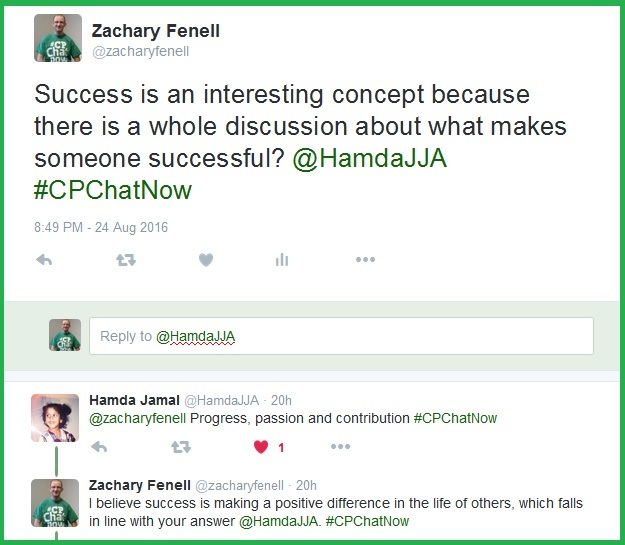 Danielle’s thought provoking questions kept our community thinking all chat long. She even challenged us to think about the topic in innovative fashion. However, not everyone said individual. 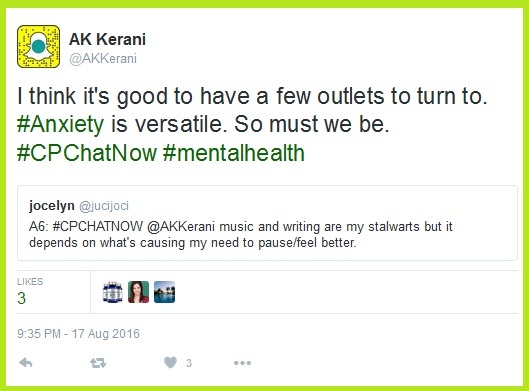 Actually, I argued mental health stands a pursuit which entails both options. 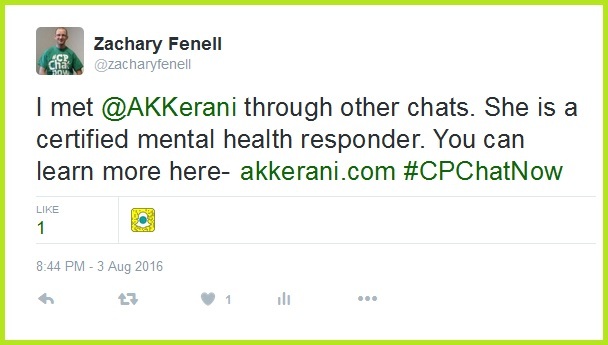 Continued chatter raised a critical aspect to mental health. Wisdom that deserves repeating, “Anxiety is versatile. So must we be.” Keep this in mind when battling your anxiety and doubts. 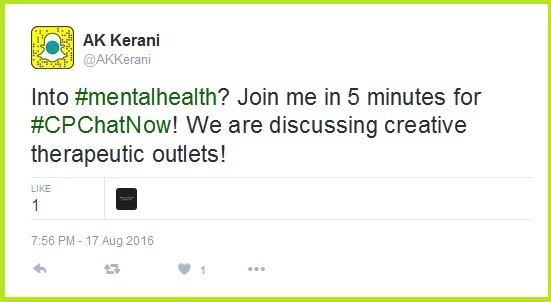 Or, when helping others combat threats to their mental health. 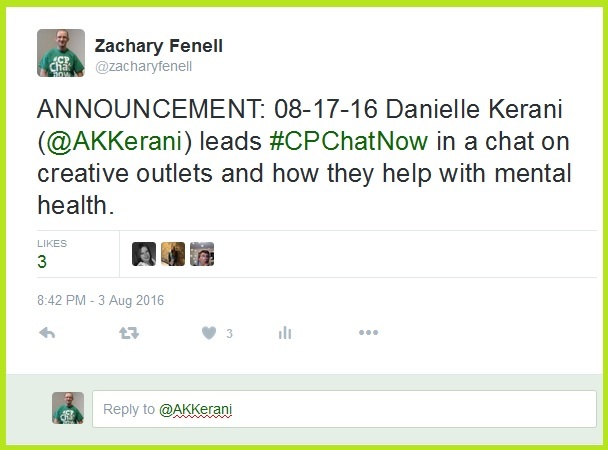 Finally, to conclude today’s recap I on behalf the #CPChatNow community wish to thank Danielle Kerani for joining us August 17th. I recommend following her on Twitter at @AKKerani. For more about her and her business visit http://akkerani.com. Simply comment below with your response. 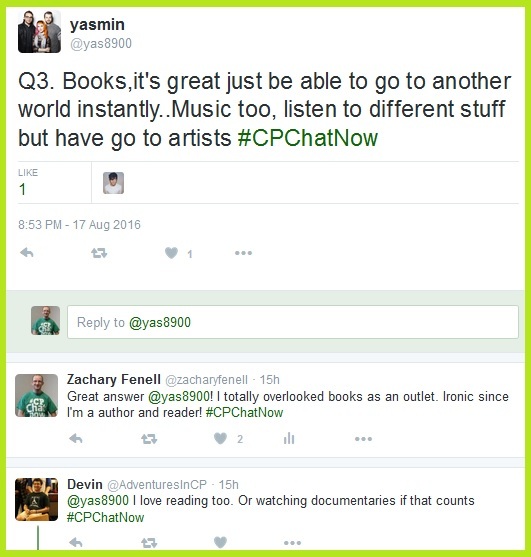 Summer proved an unofficial theme during the August 10th, 2016 #CPChatNow Twitter chat. Co-host Zachary Fenell back as promised to supply the recap. 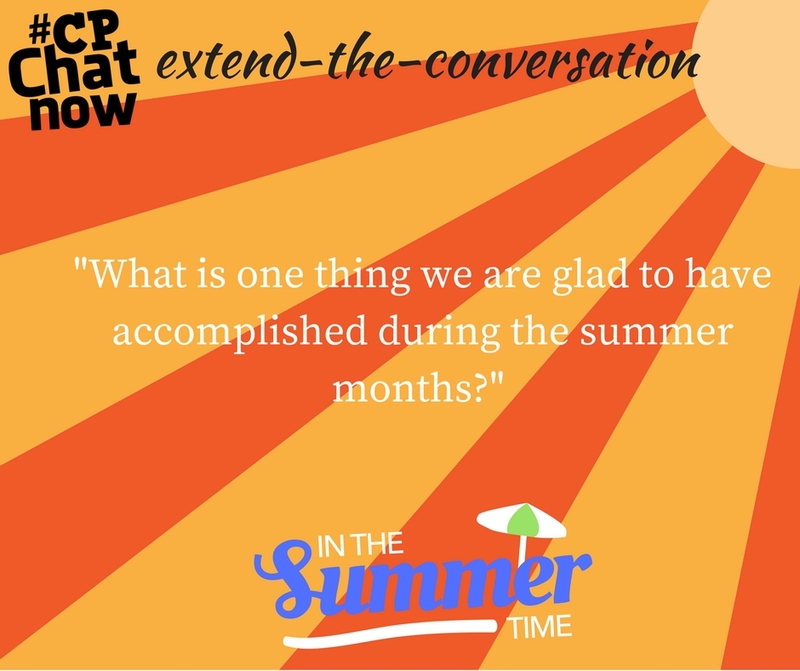 A question from my co-host Blake Henry led to the summertime discussion. Those I interviewed include my younger brother Nick and my father Bill. If interested, check the videos out. After you finish reading the recap obviously! With that shameless plug finished, let me resume focus. 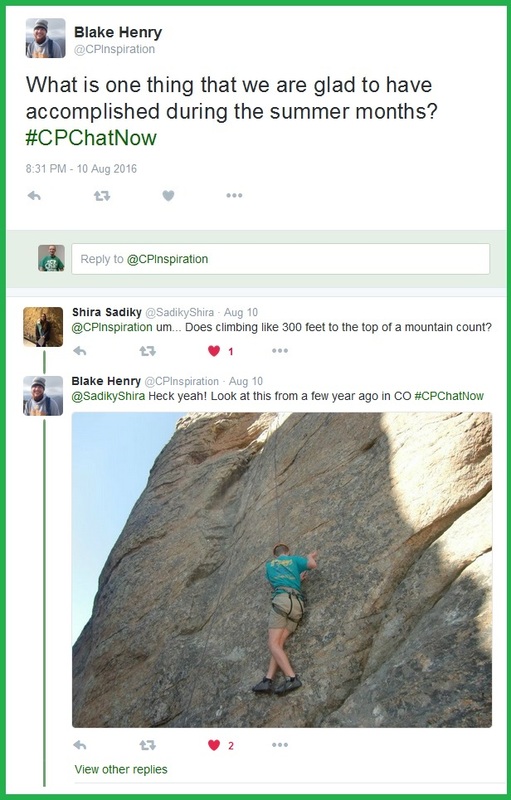 Regular Hannah Pike reminded us accomplishment manifests itself in many ways. Never overlook simple perseverance through tough times. Thriving often first requires surviving. 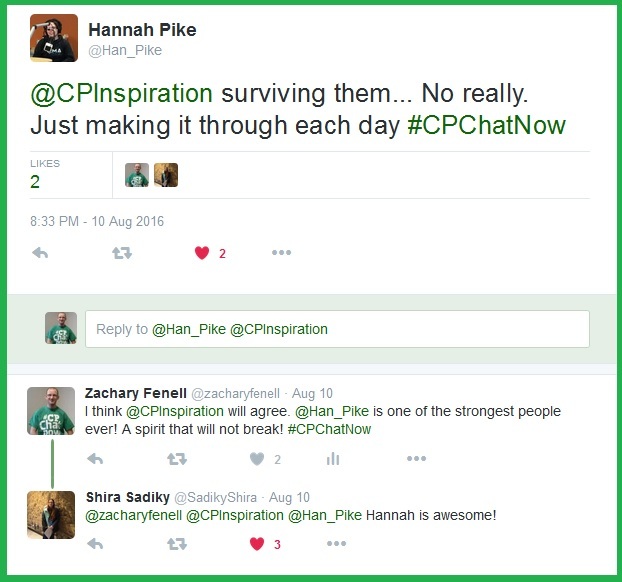 Whether a grand accomplishment or persevering, let the #CPChatNow community know your summer 2016 accomplishments. Answer today’s extend-the-conversation question. Share by leaving a comment in the “Comments” section. Moving on, talk about the Olympics kept the unofficial summer theme going. Amidst the Olympics chatter an admiration for gymnasts’ elegant movements arose. 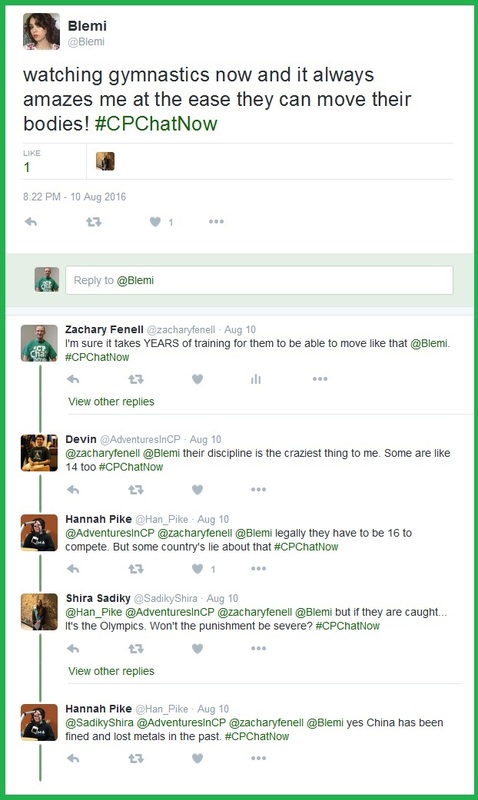 Sadly I predict with future summer Olympics officials will continue contending with lying. On a positive note, I can additionally see my co-host and I enjoying an outdoor adventure together in a future summer. A prospect we discussed August 10th. Discussion that led to insightful dialogue about using mobility devices. Blemi‘s insight about nobody caring wowed me. Your turn now! 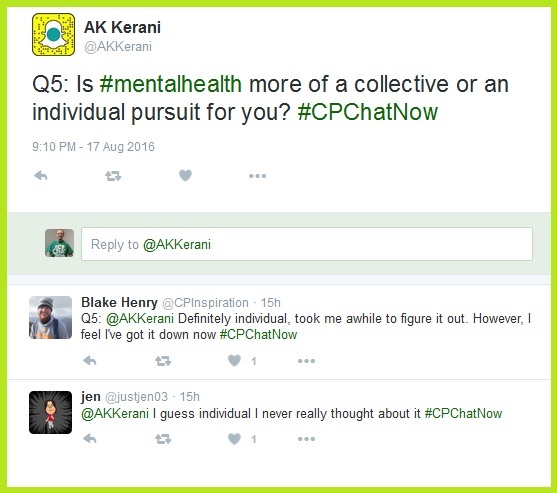 Wow me and the #CPChatNow community by answering today’s extend-the-conversation question. Comment below to brag on your accomplishments. 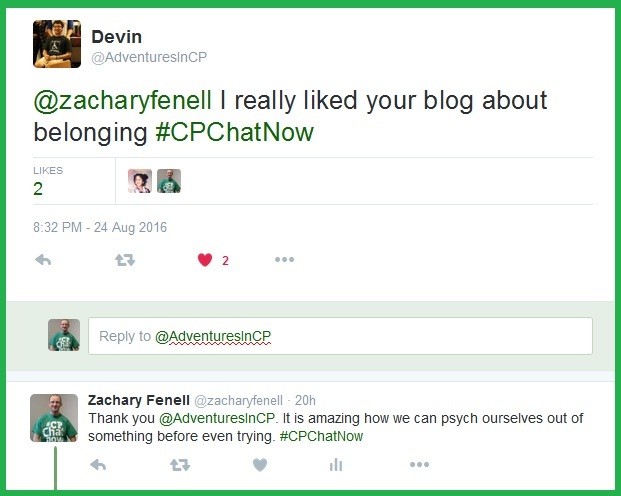 Wednesday, August 3rd, 2016 proved an eventful night for us in the #CPChatNow community. Hi, co-host Zachary Fenell here risking Saturday school with a severely tardy recap. Please allow me to explain. So, my dog ate my Twitter account. Just kidding (obviously)! Actually bad storms knocked out my power all day last Wednesday (August 10th). 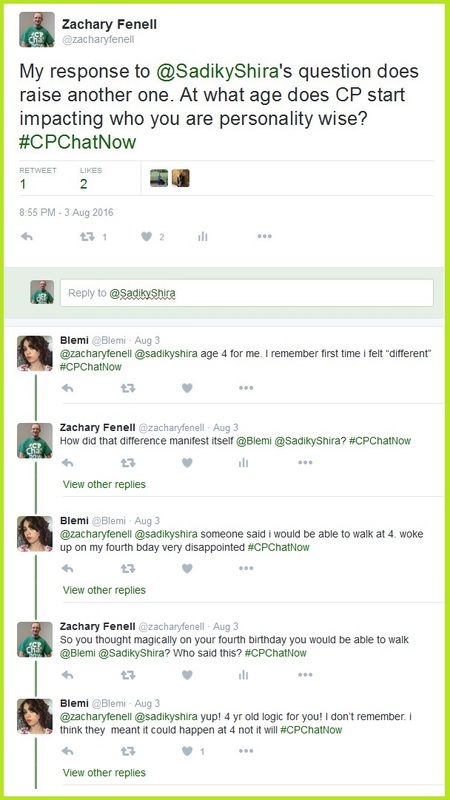 Therefore I could not complete the recap before the August 10th chat. Fear not, though! For your viewing pleasure the recaps for both August 3rd and August 10th will go up in the next 24 hours. This assuming no more power outages. Early conversation August 3rd supplied reason for gratitude and positivity. 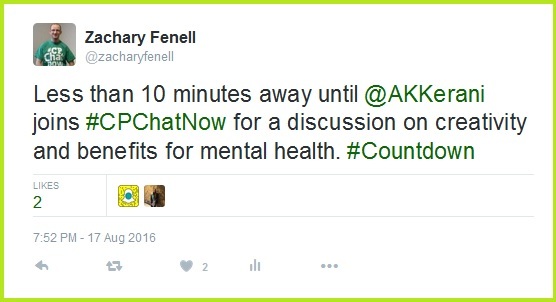 Anticipation built too as I promised to reveal our August 2016 focus chat details. 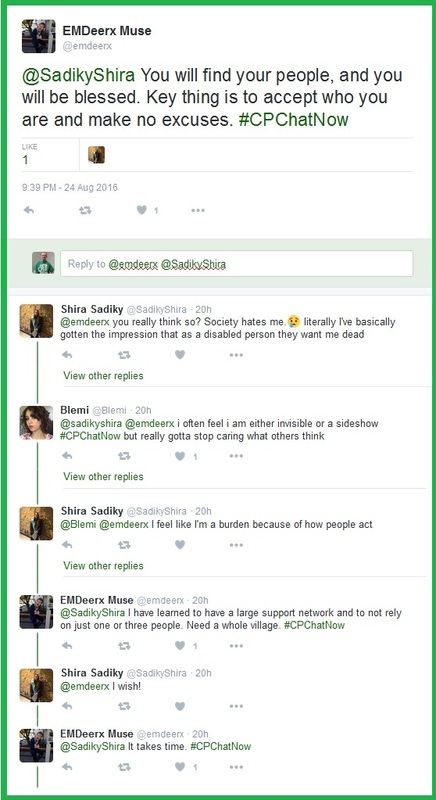 Shira went on to ease the announcement wait by igniting dialogue. That question led to another one. Overall learning how to handle differences requires strong mental health. The topic our August focus chat will cover! Go ahead and visit akkernai.com to familiarize yourself with Danielle (@AKKerani). Also note the focus chat happens TOMORROW! I hope you can join in. The chat begins at 8pm ET. 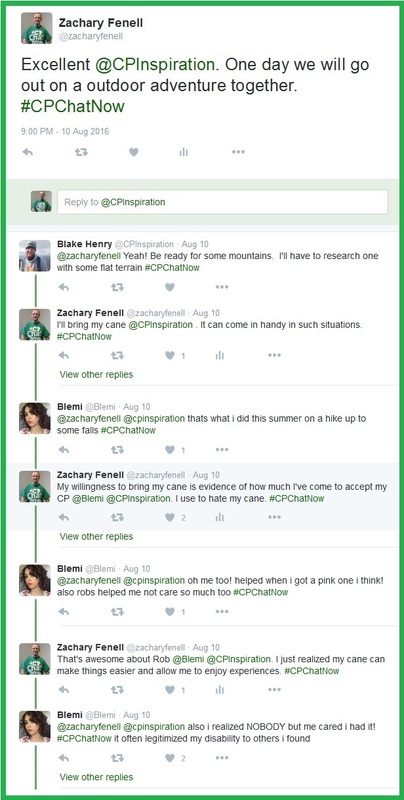 In the meantime let me finish recapping the August 3rd Twitter chat. 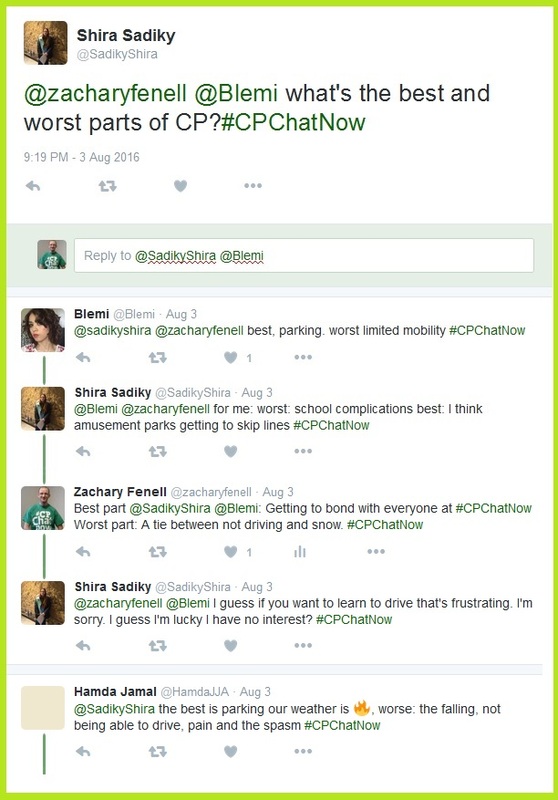 An additional highlight from the dialogue examined cerebral palsy’s best and worst parts. I’ll return soon with the August 10th recap. Until then! 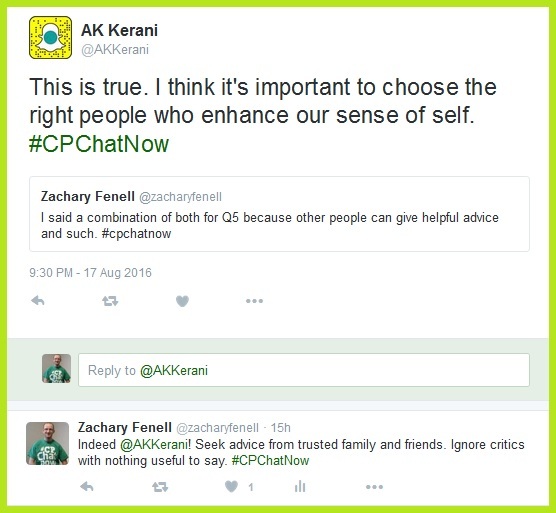 Food stole the discussion early during #CPChatNow Wednesday, July 27th, 2016’s. Co-host Blake Henry here with a delayed recap. The conversation topics were wide during the chat. The conversation went from food to eating habits, tiredness, and then concluded with bucket list. It was surprising to see how varied bucket list can be. My co-host Zachary Fenell curious if not cooking all the time for yourself is a benefit when with a significant other. Deciding on the right type of diet can be a tough decision! A regular Hannah Pike shared her diet style and the difference between specific diets. 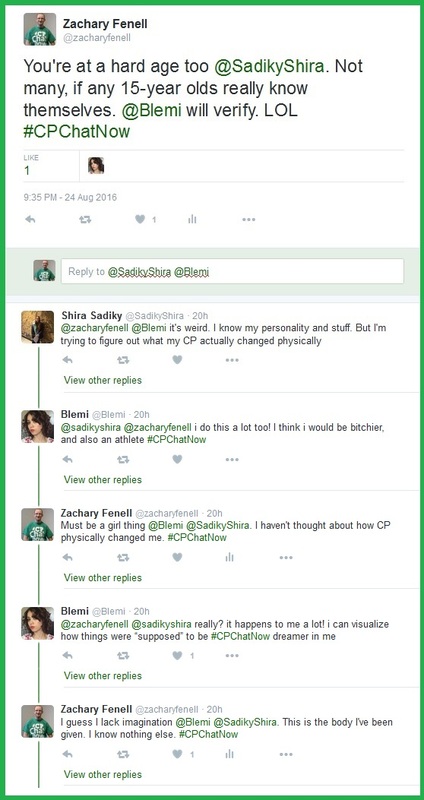 Dialogue from July 20th #CPChatNow brought back some unfinished business about energy and it’s vice tiredness. 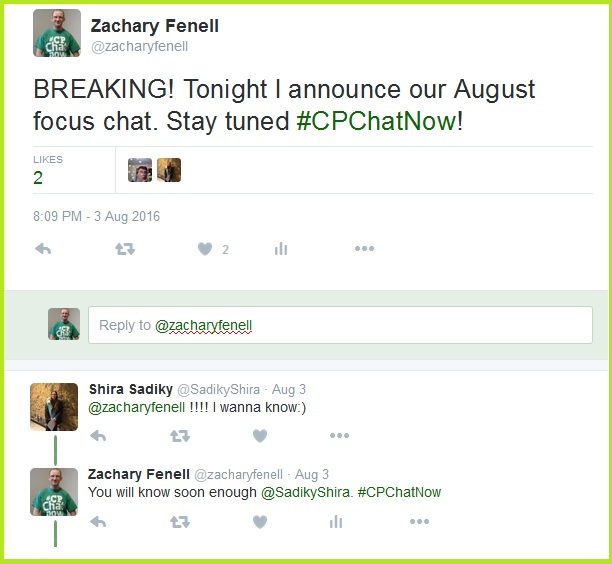 Again, Zachary Fenell with questions extended from July 20th #CPChatNow. 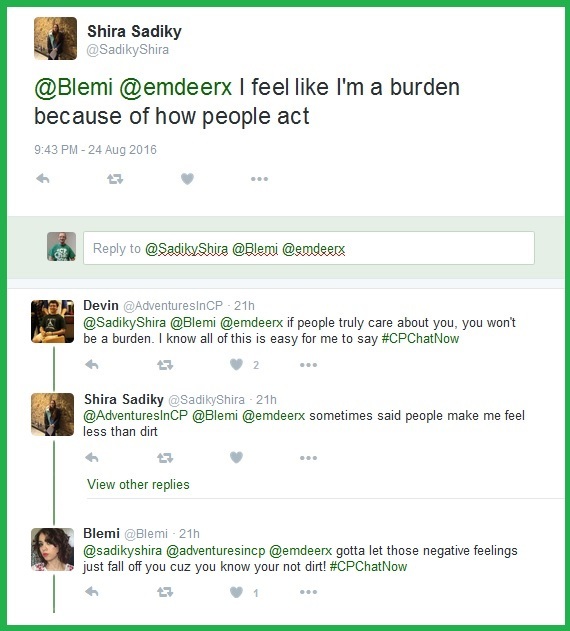 Many chat-goers chimed in and gave their opinions on what makes them tired, the worst thing anyone could be. Devin extends to us the obvious way to lessen fatigue. 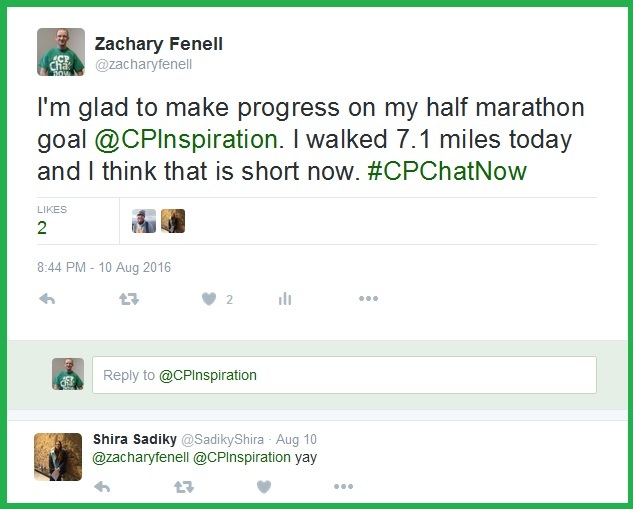 Zachary can attest to the benefits he sees in physical activity in reducing tiredness. The biggest conversation of the night – Bucket List! Jen asked an end of summer question. Many participants bucket list were interesting and some a little obscure. Many expressed wanting to see popular attractions. However, some wanted to incorporate bucket list items into something they already enjoy. Lastly, don’t forget about our monthly Google Hangout on August 11th at 8PM ET. Please connect with Zachary or myself for instructions on how to become part of the community. Thank you for viewing our website and this recap. Connect with over on Facebook.